A major source of fundraising for the Four Feet Companion Foundation, is through our fun events. We would love for you to join us and learn more about our organization and how we help animals in need. Check Out Our Calendar of Events and Join Us! 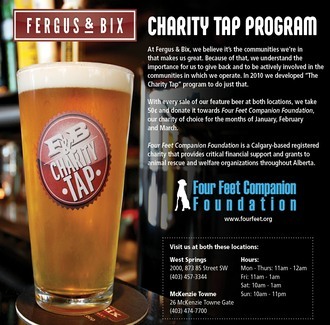 Fergus and Bix has graciously chosen Four Feet to be the recipient of their Charity Tap Program. With every sale of feature beer, 50 cents is donated to Four Feet during the months of January, February and March. 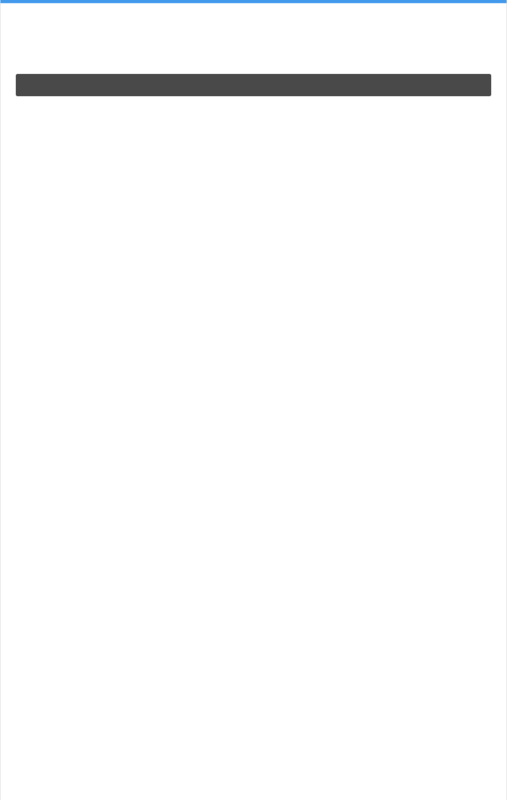 They have two wonderful location: West Springs, 2000, 873 85 St SW and McKenzie Town, 26 McKenzie Towne Gate. 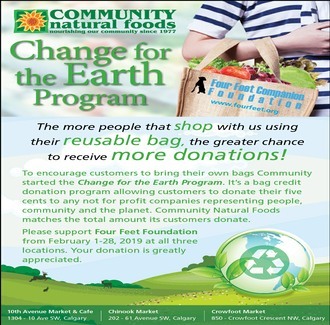 Please support Four Feet from February 1-28 at all three locations of Community Natural Foods. Through their “Change for the Earth” program you can donate your 5 cent bag credit to Four Feet purely by using your reusable shopping bag. This program is meant to encourage customers to bring their own bags and help save the environment! 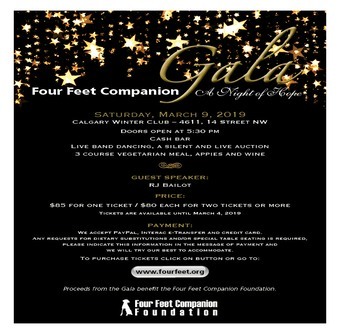 “A Night of Hope” - Four Feet’s Annual Gala is being held at the Calgary Winter Club on March 9, 2019. It is sure to be an amazing evening! See the Annual Gala page for more details and how to purchase tickets. We are a 100% volunteer run organization, focusing on animals in need.